Last week I examined a dog for itching and wound up with a surprising diagnosis. This beautiful dog has a history of allergies which require constant treatment to keep her comfortable. I though she had another breakthrough of her allergies or maybe developed a secondary bacterial or fungal infection. This wasn’t the case at all. During her examination, I found little black specks all over her body that moved. She also had thick tan colored crusts on the edges of her ears, excoriations on her abdomen and generalized inflammation. This dog itched constantly. She was miserable. Examine the microscopic image of the black specks below and then answer the following questions: What parasite is this? How did this dog become infected? Is it transmissible to people? 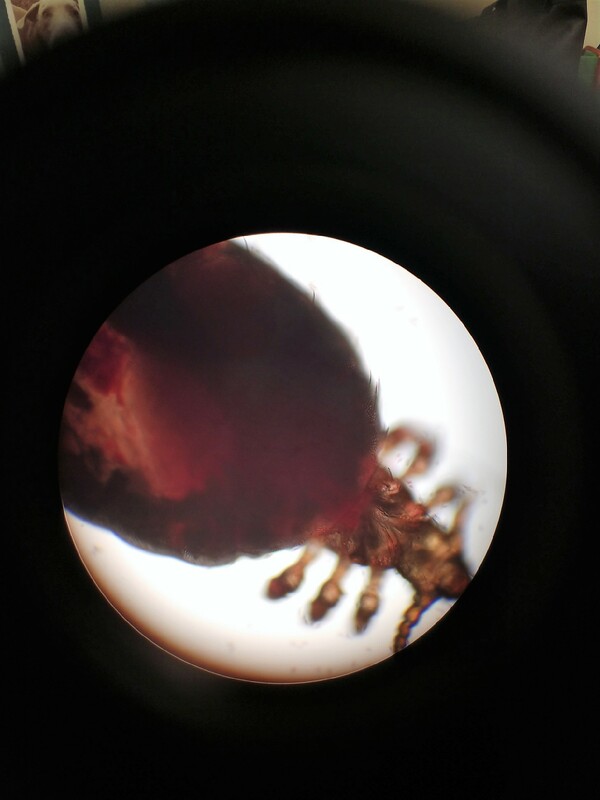 Unfortunately, my patient was suffering from pediculosis which means an infestation of lice. Lice are small parasites that are divided into two groups: 1) Chewing lice that feed on the skin (secretions, hair, fur) 2) Biting lice that pierce the skin to obtain blood. Pictured above is a biting lice. Lice spend their entire life on their victim. The adults lay eggs (nits) on the shafts of hair. Nymphs hatch from the eggs and then begin feeding on the host. They molt three times before they become an adult capable of reproducing. Lice are spread through close contact with an infested dog or contaminated objects like bedding. My patient started itching after going to the groomer. Most likely, the groomer transferred lice from an infected dog to my patient through their tools. Unlike fleas, ticks and mites, lice are fairly easy to treat because they spend their entire life cycle on the dog. There are many topical treatments that work well killing the lice within a week. I recommend treating all the dogs in the household when lice are involved. I also recommend cleaning the environment including dog beds, blankets and brushes to prevent reinfection. Since most lice are species specific, the varieties found on dogs don’t infest humans and vice versa. That means that cats don’t have to be treated either unless the lice infestation is caused by a variety called Heterodoxus spriniger. I treated my patient with Vectra 3D and she is feeling much better now. Source: Shell, Linda original author, Rothrock, Kari revision author, ‘Pediculosis’ Associate Database, VIN, last updated 6/8/2017. What’s Missing From The Guaranteed Analysis on Pet Food Labels?